With a pair like Freeman and Cumberbatch, you can’t go wrong. It’s official. I’ve fallen into yet another fandom. It was only a matter of time before Sherlock wandered into my life. If anything, it’s a natural progression from both Doctor Who and The Hobbit. Ok, not really, but there’s the BBC angle and another show that they both were in, so it’s close. If anything, starting viewing this late into the seasons is a bit of a perk. I don’t have to wait as long between seasons, which has been the number one complaint with the show. At the same time, I’ve seen so many spoilers that the epic moment when Sherlock tosses himself from the building has been completely spoiled. (And if you hadn’t heard that, what rock have you been living under?) I’m still a season out from that point. When you only watch between 30-45 minutes of grown up programming a day it takes a while to get through a season of anything. Sherlock has a lot of great stuff going for it. First of all, the stories are well written, which as a writer means a whole heck of a lot. Secondly, they found a truly inspired pair to play Sherlock and Watson. Everyone loves Benedict Cumberbatch’s performance of Sherlock in much the same way that everyone loves Leonard Nimoy playing Spock. He’s broody, he’s complex, he’s hyper-intelligent, he’s got a sensitive underbelly that he very rarely shows, but when he does it is overwhelming. It makes him instantly fascinating to watch, like some rare exotic animal. And then there’s his voice, which can be compared to rich deep dark chocolate ganache. Sherlock would not be half as interesting without his Watson. 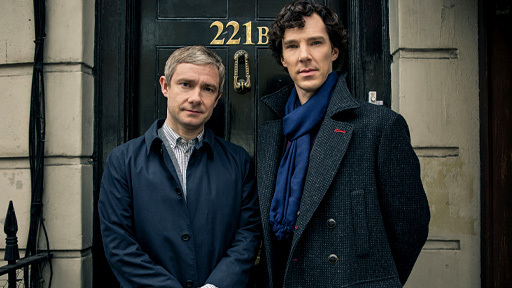 In the literature Watson is there as Sherlock’s foil. He responds to Sherlock’s bizarre behavior as any normal person would and gives the viewer an anchor to hold on to as well as perspective. Martin Freeman serves as a perfect foil. He’s smart in his own way, but his is an accessible and useful knowledge. He knows how to function as a normal human being, where Sherlock often forgets. It’s his responses to Sherlock, his bafflement, his willingness to help a friend, his innocence, that makes the whole program work. He gives the audience that much needed dose of reality. He is the warmth against Sherlock’s frosty exterior, he is the humanity against Sherlock’s disregard for other’s feelings. And he is completely adorable. The show itself tends to be dark and brooding and for me it’s best sampled in small doses. Most of the crimes to be solved revolve around murder and the basest elements of society and the show has no qualms dragging the viewer into the thick of it all. There is adventure and intrigue and the thrill of the chase paired with this really unique and often charming relationship between two unlikely friends. All in all I consider it a hit and hope that by some stroke of luck they release another season before I get to the end of this one!